LOS ANGELES and LONDON — May 10, 2018 — The Beach Boys are pleased to announce a new album, The Beach Boys with the Royal Philharmonic Orchestra, to be released worldwide on June 8 by Capitol/UMe. Produced by Nick Patrick and Don Reedman, the album pairs The Beach Boys' original vocal performances with new symphonic arrangements, newly recorded by the Royal Philharmonic Orchestra at Abbey Road Studios. Available now for preorder in digital, CD, and 180-gram 2LP vinyl LP formats (2LP vinyl to be released August 17, 2018), The Beach Boys with the Royal Philharmonic Orchestra spans decades of timeless Beach Boys hits and favorites across its 17 tracks. Starting today, “Fun, Fun, Fun” is available for streaming and for immediate download with digital album preorder. On March 8 and 9, 2018, the Royal Philharmonic Orchestra convened in Studio 2 at Universal Music Group's Abbey Road Studios in London, the storied room where The Beatles, Pink Floyd, and other legendary artists have recorded some of the world's most cherished music. There, they recorded new orchestral arrangements to complement The Beach Boys' classic vocal harmonies from the legendary group's original recordings. Conducted by Steve Sidwell and Sally Herbert, who also wrote several of the album's new symphonic arrangements, the orchestra dove into The Beach Boys classics, including the new album's earliest hit, 1964's “Fun, Fun, Fun,” and its most recent one, 1988's “Kokomo.” The album also features the orchestra's new turns on the signature classics “Good Vibrations,” “California Girls,” “Wouldn't It Be Nice,” “God Only Knows,” “Sloop John B,” “Help Me, Rhonda,” “In My Room,” “Disney Girls,” and several more. 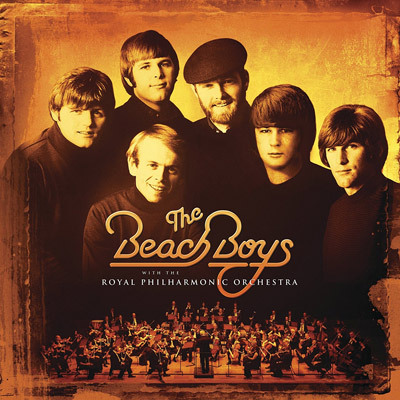 The resulting album, The Beach Boys with the Royal Philharmonic Orchestra, honors The Beach Boys' artistry and innovation in an inspired new way with the group's first album collaboration with a full orchestra. The Beach Boys with the Royal Philharmonic Orchestra co-producer Don Reedman says, "To be able to make this record, it's a great honor. The feeling you get, listening to the original recordings and the performances, and then to be able to put our expression into their recordings through our arrangements and the Royal Philharmonic Orchestra is an absolute thrill." The Beach Boys continue to hold Billboard / Nielsen SoundScan's record as America's top-selling band for albums and singles, and they are also the American group with the most Billboard Top 40 chart hits (36). “Good Vibrations” was inducted into the Grammy Hall of Fame® in 1994. Sounds of Summer: The Very Best of The Beach Boys has achieved triple-Platinum sales status and The Smile Sessions, released to worldwide critical acclaim in 2011, was heralded as the year's Best Reissue by Rolling Stone and earned a Grammy Award® for Best Historical Album. That's Why God Made the Radio, The Beach Boys' 2012 studio album celebrating their 50th anniversary, debuted at No. 3 on the Billboard 200 albums chart. Inducted into the Rock and Roll Hall of Fame in 1988 and recipients of The Recording Academy's Lifetime Achievement Award, The Beach Boys are a beloved American institution that remains iconic around the world. The story of the Royal Philharmonic Orchestra (RPO) is colorful and dramatic with a reputation worldwide for music-making of the highest quality. In 1946, Sir Thomas Beecham set out to create a world-class ensemble from the finest musicians in the UK. Beecham envisioned an orchestra that would bring the greatest music to audiences across the world and, to this day, Beecham's legacy lives on. Over the years, the RPO has become a byword for exceptional quality and versatility, undertaking a diverse range of activities from traditional concerts in concert halls to classical spectaculars and 'cross-over' concerts in arenas. The Orchestra is London-based and performs regularly at the Royal Albert Hall, Cadogan Hall, and Southbank Centre's Royal Festival Hall, as well as undertaking a busy schedule of UK concerts, international tours, recordings for CD, film and television, and community and education work. For more information, visit www.rpo.co.uk.